For 33 years, Peter Andjelkovich & Associates has been dedicated to meeting the legal needs of individuals and businesses in Chicago and throughout surrounding communities in Illinois. We are committed to excellence — Peter Andjelkovich, our firm’s founder, has achieved an AV® Preeminent™ Peer Review Rating by Martindale-Hubbell®, a distinction signifying the highest quality legal work, professionalism and ethical standards. 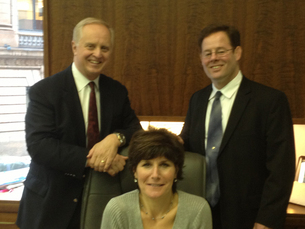 We are seasoned trial attorneys and skilled negotiators. We protect your rights and interests in state and federal courts and in local, state and federal civil rights administrative tribunals and various arbitration proceedings. We have successfully prosecuted and defended several lawsuits that received prominent national and local media attention. And we are just as comfortable at the negotiation table as we are in court. Business litigation ― From breach of contract to partnership disputes, we provide litigation services in state and federal courts to protect your interests and counsel you on how to avoid being sued. Labor and employment law ― Whether you an employee wronged at your workplace or an employer in need of assistance with state and federal regulatory and compliance or other employment law issues, we can help. Personal injury ― We help obtain just compensation for clients who have suffered injury or loss of a loved one due to the negligent actions of an employer, a driver, a medical professional, a landlord or a manufacturer. Peter Andjelkovich & Associates successfully serves individuals and businesses in Chicago and throughout Cook, Lake, Dupage and Will Counties. To discuss your how we can help you, call Peter Andjelkovich & Associates at 312-782-8345 or contact us online to schedule an appointment.